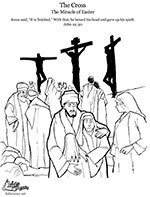 Pilate's orders were carried out and Jesus, the Son of God, was crucified. (firm) Bring the prisoner. We'll put him between these criminals. (angry) You heard the Centurion. (mocking) Get over there your highness. (reverb) Father, forgive then. They don't know what they are doing. Here's the sign from Pilate. Put it on the top of the cross. (startled) (reading) This is the King of the Jews. (Questioning) Centurion is this a joke? The sign came from Pilate himself. (mocking) I've never crucified royalty before. If you are a king, why not save yourself? Enough talk. Raise him up! (mocking) Now all these people can hail their king. Back in Jerusalem, Jairus and his family notice dramatic changes outside their window. (troubled) Jairus. Jairus come here!? Look outside. See how dark it's getting. I've never seen such a thing. I wonder why it would get so dark at noon? I think we better light some lamps. Daddy, where has the sun gone? I've felt this darkness before. Felt this darkness? What do you mean? When I was sick. It got dark like this. And then next thing I knew…there was Jesus face. Jerusalem has many strange things happening in it these day's. Daddy, just before I came in I heard some people on the street talking about Jesus. They said he was being crucified on a hill outside the city gate. I hoped you wouldn't find out till after we celebrated Passover. They talked about it like it was a good thing. They were laughing at him. They said, "He could save others, but He couldn't save himself". It was terrible. I'm sorry you heard that. Many in Jerusalem didn't like Jesus and wished for the day He would die. Daddy, Is it too late to save Him? It's too late. We can't do anything now. (pause) Why don't you help your mother light some lamps. Yes and we better hurry. (soft voice) Father Into your hands (gasp) I commit my spirit. Jesus was crucified, but his enemies were still worried. What do you want at this hour? Him again. I've already given permission to bury Him. Gave it to one of your council members. A Joseph of Arimathea. I've heard. We are concerned that there might be trouble. What kind of trouble, the man's dead. Some of our informants have told us Jesus spoke of rising to life after three days in the tomb. We fear his disciples might have some plot. A plot to bring to life a crucified man? Do you think I'm a fool? We fear someone might steal the body. Then say he was raised. If they are successful there's no telling what could happen. I see. Very well then, secure the tomb. I will authorize the imprint of a seal and the posting of a guard. Make sure I don't have to talk about this Man again. He troubles me. He still troubles me. Yes your excellency. Thank you your excellency. Centurion the tomb is secure. Very well. To your posts. And stay sharp. I don't want any dead men escaping on my watch.